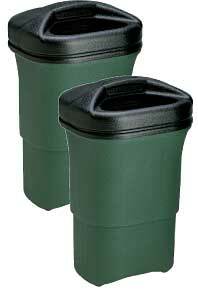 Litter mate double trash receptacles; includes hardware & two trash opening lids. For use on the Tradition Tee Console (SKU# 36230) . These 9 gallon units feature UV-resistant polyethylene construction, are rust-proof and will not dent. Comes with hardware & two trash opening lids. Not available on Turfstone Tee Console. Please Note: Oversize shipping surcharge of $25.00 applied to this item.